Dr. Narendra G. Patwardhan, a Dermatologist in Pune, India visited our office today in Alpharetta, GA and observed Dr. Cole perform his method of FUE known as CIT (Cole Isolation Technique). Dr. Patwardhan was the program chairman for the Association of Hair Restoration Surgeons of India 2012 annual HairCon meeting in Calcutta, India. 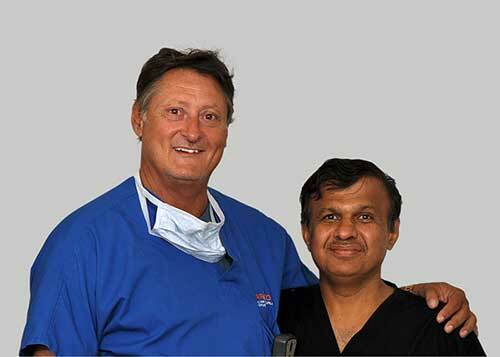 Patwardhan stated that this was one of the best state-of-the art facilities he had ever been in and that Dr. Cole and his team of staff did an excellent job of transplanting over 2500 FUE grafts on one patient in only 4-5 hours. Dr. Patwardhan was most impressed and fascinated at the ease and precision at which Dr. Cole and his well-trained staff were able to use the instruments that were created by him and was very happy to observe these instruments being used live in action by Dr. Cole. He especially found that the PCID was very fascinating to watch in action. Dr. Patwardhan said that there were several advantages to the methods and instruments that we use here in Dr. Cole’s practice and compared them to how he currently practices in India. In India he used two pairs of forceps to place grafts. Our surgical team here uses of one pair of forceps to place the grafts and Dr. Patwardhan stated that was much more efficient and speedy way to place grafts during surgery. He was also impressed by the speed and comfort that the patient was in while anesthesia and fluids were being administered using the Self-Filling Device. He had never seen such a device as the Electric Graft Chilling Device and said it significantly increased the survival of grafts to used this device over the ice chilling method that he uses in India. All-in-all Dr. Patwarhan was very excited to have the opportunity to view Dr. Cole’s techniques live and to see all of the instruments he promotes being used in the FUE surgeries that he performs every day. He would highly recommend that any patient wanting an FUE hair restoration procedure to come to Dr. Cole for their surgery.